but the power of these pictures has barely faded. No conflict in recorded history transformed the globe as thoroughly as World War II. Cities were obliterated; national borders were altered; revolutionary and, in some cases, fearsome military, medical, communication and transportation technology were invented; and tens of millions were killed — the majority of them civilians. Simply put, the world of August 1945, when the war ended, bore little resemblance to that of September 1939, when Nazi Germany invaded Poland. 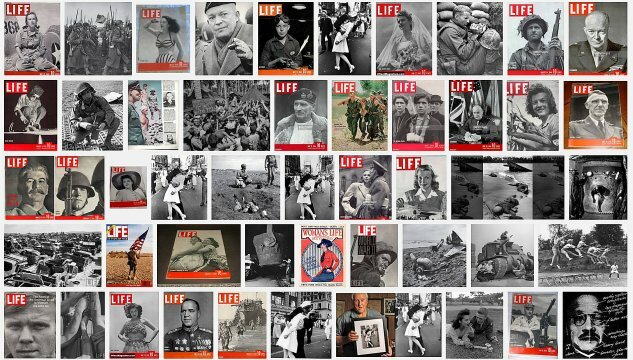 During those six long, uncertain years, LIFE covered the war with more tenacity and focus than any other magazine on earth. Twenty-one LIFE photographers logged 13,000 days outside the U.S.; half of that time was spent in combat zones. 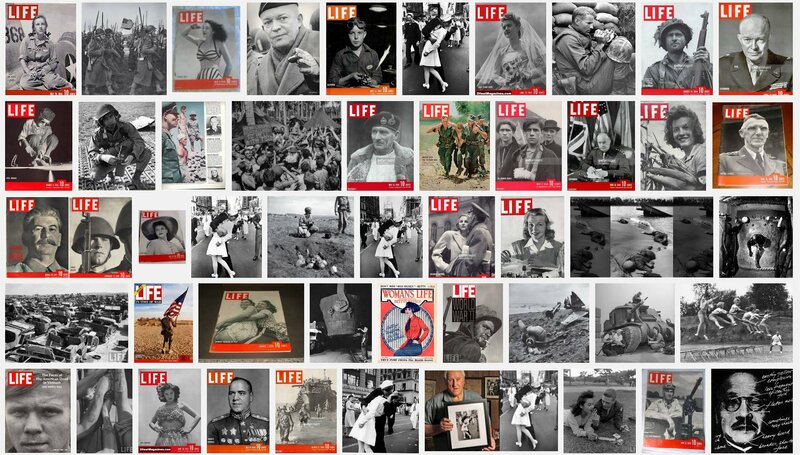 In tribute to those journalists, and to the men, women and even children who sacrificed so much in the Allied war effort, LIFE.com combed the magazine’s unparalleled archives for some of the greatest pictures made during WWII — often searing, occasionally lighthearted, always memorable images from the streets of Blitz-ravaged London to the sands and jungles of Saipan, Guadalcanal and Iwo Jima. Seven decades have passed since the war ended, but the power of these pictures (several of which were never published in LIFE) has barely faded: confronting them today, we’re still dumbstruck by the destruction; we still flinch at the scale of the suffering; and we marvel at the courage of the men and women whose unity of purpose kept the flame of hope alive in the darkest hours. 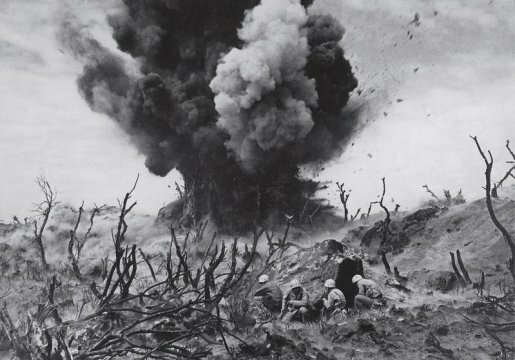 In a picture that captures the violence and sheer destruction inherent in war perhaps more graphically than any other ever published in LIFE, Marines take cover on an Iwo Jima hillside amid the burned-out remains of banyan jungleas a Japanese bunker is obliterated in March 1945. 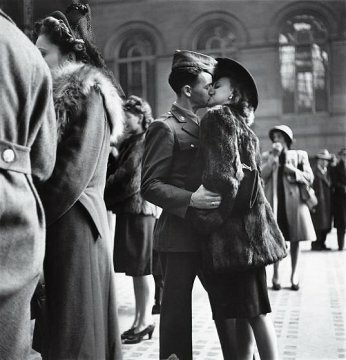 In this and dozens of other, similar pictures made at New York's Penn Station in 1944, LIFE's Alfred Eisenstaedt captured a private moment repeated in public millions of times over the course of the war: a guy, a girl, a goodbye - and no assurance that he'll make it back. 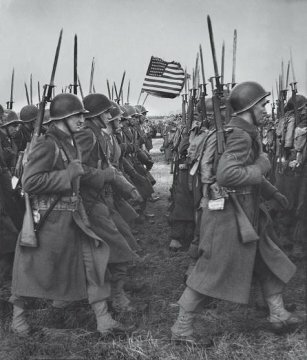 By war's end, more than 400,000 American troops had been killed. During 1940's Battle of Britain, Luftwaffe bombers tried to destroy British air power ahead of a planned invasion of the UK. 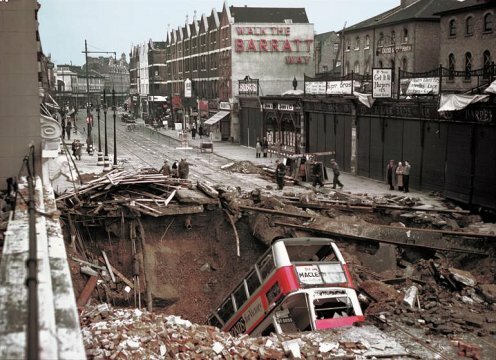 When that failed, Hitler resorted to terror attacks on civilians, including the full-scale bombing of London (pictured) and other English towns. The attacks killed tens of thousands of Britons, but "The Blitz" fizzled: the invasion never materialized. 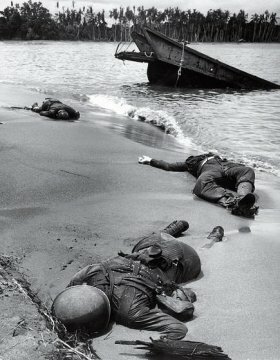 Three American soldiers lie half-buried in the sand at Buna Beach on New Guinea. This photo was taken in February 1943, but not published until September, when it became the first image of dead American troops to appear in LIFE during World War II. George Strock's photo was finally OK'd by government censors, in part because FDR feared the public was growing complacent about the war's horrific toll. 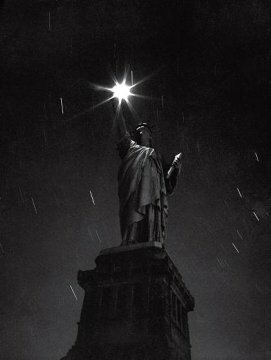 The Statue of Liberty, photographed during a blackout in 1942 - an eloquent expression of the nation's mood in the first full year of a global conflict with no real end in sight. 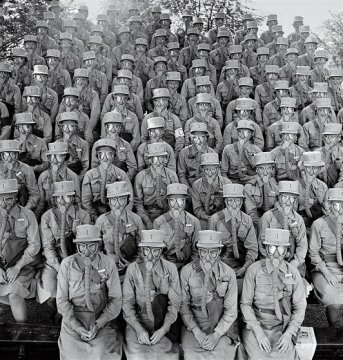 Members of the Women's Auxiliary Army Corps, commonly known as WAACs, don their first gas masks at Fort Des Moines, Iowa, in June 1942. The female troops were famously praised by General Douglas MacArthur, who called them "my best soldiers." 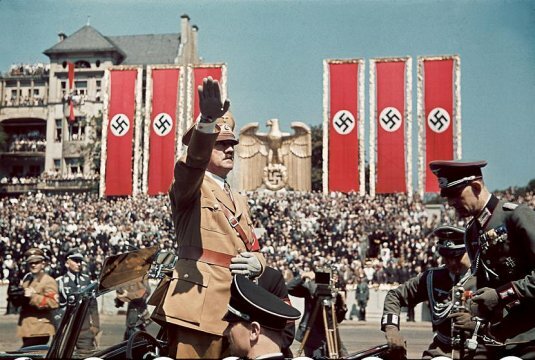 A photo taken by Hitler's personal photographer shows a 1939 rally in which Hitler salutes Luftwaffe troops who fought with Francisco Franco's ultra-right wing nationalist rebels in the Spanish Civil War. 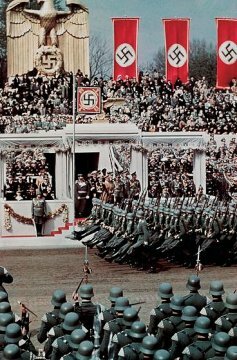 Soldiers goose-step past the Fuhrer in honor of Hitler's 50th birthday, April 20, 1939. Less than five months later, on September 1, the Third Reich's forces invaded Poland. 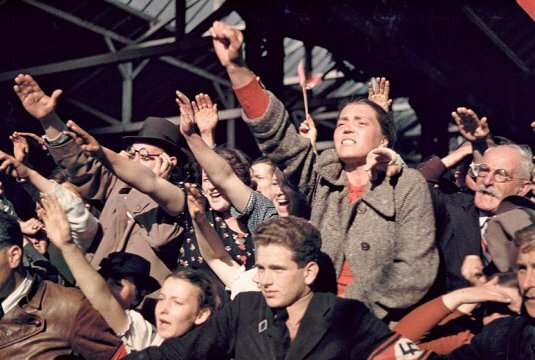 Austrians cheer Adolf Hitler during his 1938 campaign to unite Austria and Germany. In the rapt faces, straining bodies, and adulation of the crowds swept up in Hitler's mad vision, one senses the eagerness of millions to forge a "Thousand Year Reich" at, literally, any cost. 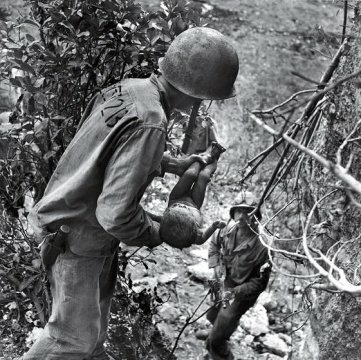 In a photo that somehow comprises both tenderness and horror, an American Marine cradles a near-dead infant pulled from under a rock while troops cleared Japanese fighters and civilians from caves on Saipan in the summer of 1944. The child was the only person found alive among hundreds of corpses in one cave. Members of the U.S. Army Air Corps' legendary 99th Pursuit Squadron, the Tuskegee Airmen, receive instruction about wind currents from a lieutenant in 1942. 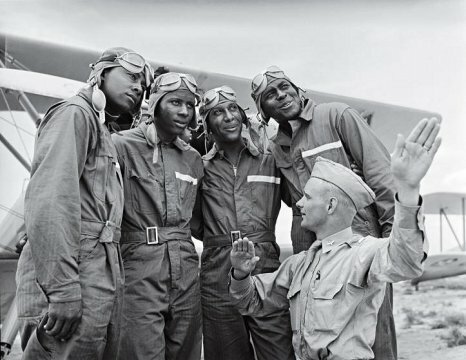 The Tuskegee fliers - the nation's first African American air squadron - served with distinction in the segregated American military. 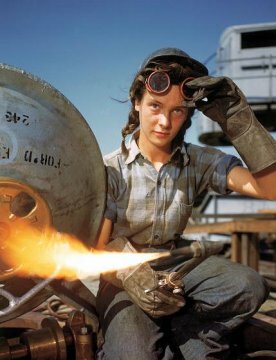 A welder at a boat-and-sub-building yard adjusts her goggles before resuming work, October, 1943. By 1945, women comprised well over a third of the civilian labor force (in 1940, it was closer to a quarter) and millions of those jobs were filled in factories: building bombers, manufacturing munitions, welding, drilling and riveting for the war effort. Army medic George Lott, wounded in both arms in November, 1944, grimaces as doctors mold a cast to his body. 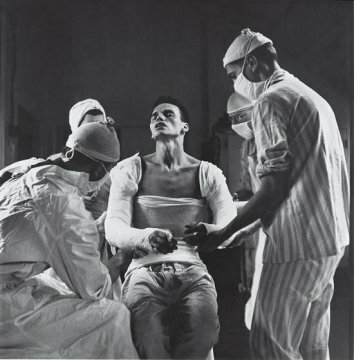 When Lott embarked on a 4,500-mile, seven-hospital journey of recovery, photographer Ralph Morse - astonished by the high level of medical care wounded troops received both at the front and behind the lines - traveled with him, and chronicled Lott's odyssey in a revelatory cover story for LIFE. 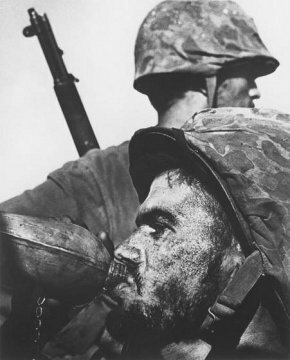 Photographer W. Eugene Smith's picture of a Marine drinking from his canteen during 1944's Battle of Saipan is as iconic a war picture as any ever made. In fact, when the U.S. Postal Service released a "Masters of American Photography" series of commemorative stamps in 2002, Smith was included - and this image was chosen as representative of his body of work. 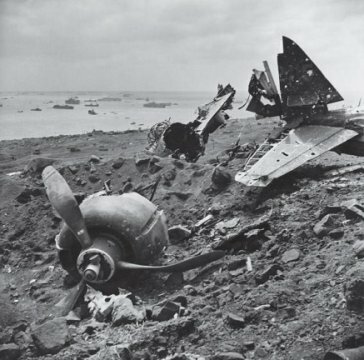 An exemplar of a bitter, grueling land battle, Iwo Jima also saw prodigious air and sea power brought to bear as American and Japanese troops clashed over control of the tiny Pacific island. American forces finally captured Iwo Jima - and its two strategic airfields - in late March, 1945. 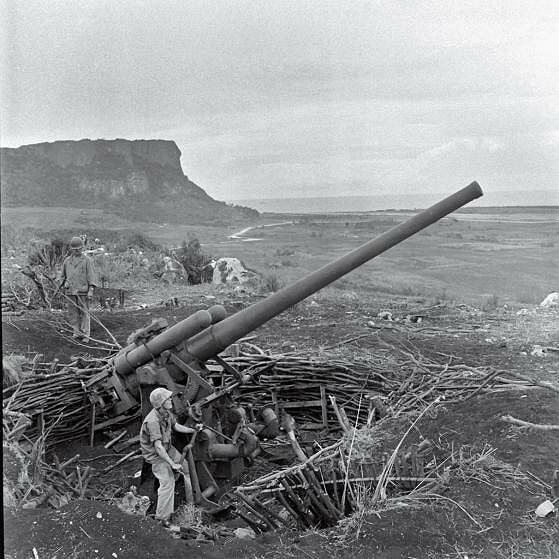 A crew maneuvers an enormous piece of artillery during the Battle of Saipan, 1944. In the waning days of the struggle for the island, thousands of Japanese civilians and troops committed suicide, rather than surrender to American troops. Many leapt to their death from the top of sheer cliffs that fall 200 feet to rocks and surf below. 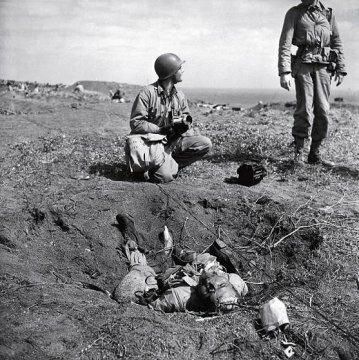 American troops chat near a dead Japanese soldier on Iwo Jima. The degree to which the Japanese were willing to fight to the death, rather than surrender, is summed up in one remarkable statistic: Close to 20,000 Japanese soldiers were killed during the battle; only around 200 were captured. GIs tramp in review across an English field, 1944, as the long-planned Operation Overlord - the D-Day invasion of France - draws near. With 160,000 Allied troops taking part, the cross-Channel attack was the single greatest air-land-and-sea invasion in military history. 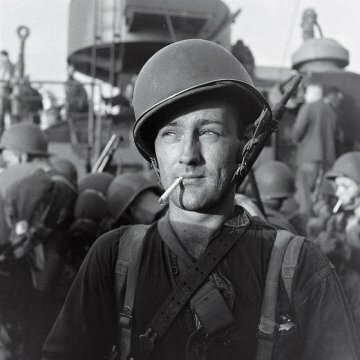 An American Marine readies to land on Guadalcanal during the five-month struggle for the island between late 1942 and early 1943. Three thousand miles south of Tokyo, Guadalcanal was a major shipping point for military supplies. The Allied victory there in February, 1943, marked a major turning point in the war after a string of Japanese victories in the Pacific. 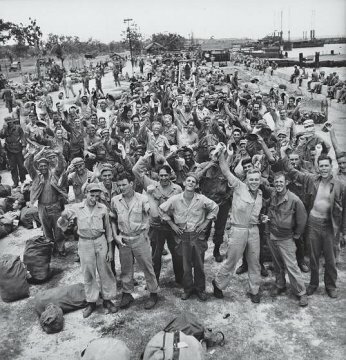 American troops in the Philippines celebrate the long-awaited news that Japan has, finally, unconditionally, surrendered in August 1945. 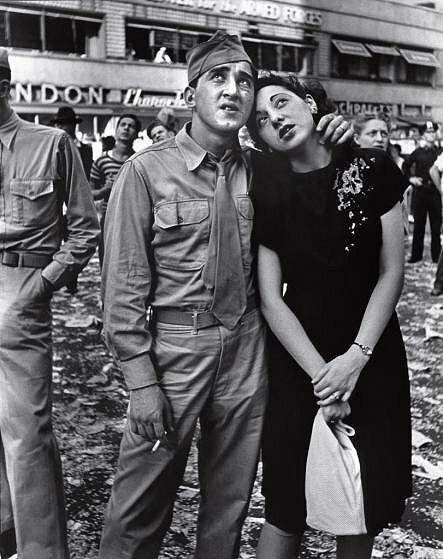 Peace at last: V-J Day, Times Square, August 14, 1945.